As Art Director at StickerYou, everyday I see plenty of orders from bride-to-be’s for wedding labels in all shapes and sizes. So imagine my excitement when my boyfriend finally proposed (after 7 years…seriously!) and it was my turn for all the fun! I’ve always been crafty and creative, so having the many custom stickers and products from StickerYou at my disposal was sure to be invaluable. 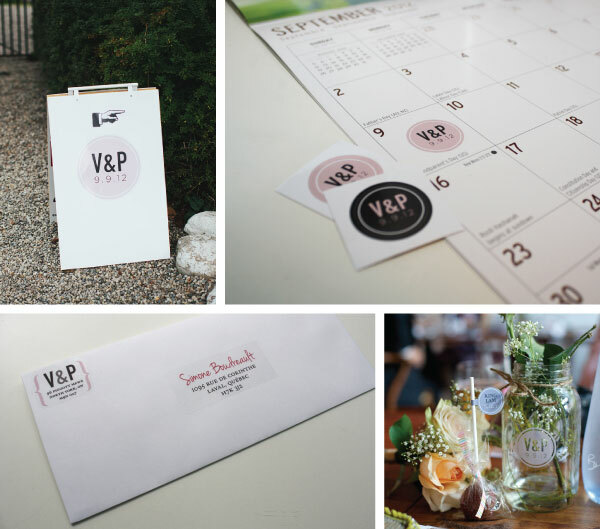 As soon as I nailed down my wedding logo, I got to work to print off some calendar stickers for my save-the-dates. This was a fun way for my guests to easily mark their calendars or stick up reminders in anticipation of the party I was planning. Since I delivered most of my save-the-dates in person (postage is not cheap these days!! ), I also dropped off the stickers with friends and family who all loved them, many asking for extras to put on their organizers and fridges. I even had an instance where a friend of mine who wasn’t even on my guest list asked for some of these stickers anyway, because who doesn’t love free stickers? Generating hype for my big day was a joy I’m sure every bride will experience. Next up, I made custom address labels for my invitations. While writing up each address on the envelopes may have been a more economical option, making these custom labels online allowed me to keep my wedding colors and fonts (yes, designers can spend more time picking out their wedding font than their dress!) and saved me the pain of early arthritis from writing for 3 hours straight. Once I got going, I had a thousand other ideas for how I can use stickers to accentuate my party. I had to make a sign to point to the small hidden entrance to the garden where my ceremony was held, so I borrowed from my real estate agent friend his “For Sale” sign, and stuck an oversized sticker of my wedding logo (which all my guests recognized from staring at the one they stuck on their mirror for 6 months!) along with an arrow pointing to the door. 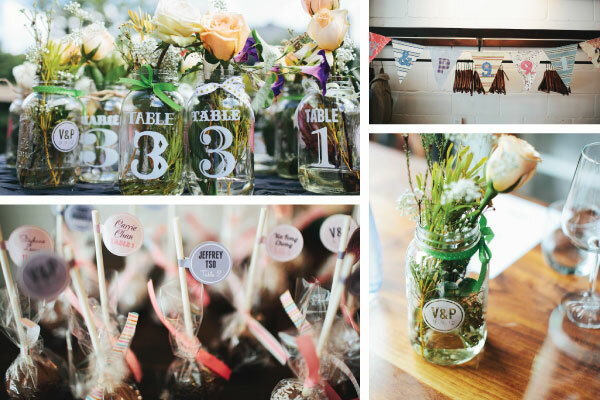 For my centerpieces, I used clear stickers with my logo and table numbers and stuck them on mason jars. I placed a few of these at each table with some water and fresh flowers in them, tied with a variety of ribbons and twine for a simple but elegant and rustic look. For my guest favors, I commissioned our best man’s wife who is a baking whiz to make cake pops, and we wrapped a sticker tag on each cake pop stick with the guest’s name along with their table number. These served as their reception place cards as well! For additional décor, I even made a few bunting banners, which were all the rage over Pinterest at the time, and used StickerYou’s Make+Print™ Fabric Transfers to print out each letter so I can cut it out and sew onto the triangles of fabric which I used for my banners. I loved doing this and got many compliments from my guests! They were such a hit I even offered to make my sister one for her wedding the following year, and another for one of my bridesmaids’ baby shower the year after that….after all, you will definitely feel indebted to your bridesmaids after all the nagging and stress you put them through! All in all, planning for and experiencing my wedding day was absolutely amazing (something I did not realize until way after the fact, of course), and having StickerYou and their product label design and variety of different products, materials, shapes and sizes really helped me achieve the perfect wedding I had always dreamed of.